When you feel that morning brain-lag coming on and you need caffeine, you need it right now – not when the barista finishes texting, not when Greg from accounting brews a new pot of the office swill. The Minipresso from Wacaco is a hand-powered espresso machine you can use right at your desk for fresh, hot coffee goodness. Unlike other desktop coffee makers, this one actually produces high-quality espresso in small quantities. The process of making an espresso looks a bit fussy in the video, particularly the parts when you have to tamp the grounds and then pump the button a hundred times. But compared to buying, cleaning and maintaining a full-size traditional espresso machine, this is a breeze to handle. If you don’t like the idea of messing with the grounds, the Minipresso can also be fitted with an adapter to accept Caffitaly pods. 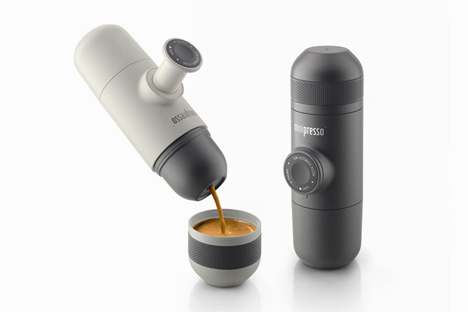 The Minipresso even includes its own cup, so other than the grounds and hot water you have to provide, it’s a self-contained espresso maker. Cleanup couldn’t be easier: rinsing the parts in water and drying out the water chamber are the extent of the cleaning process. It’s not just for office slaves, either. 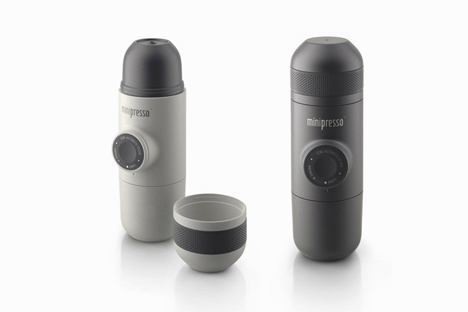 The Minipresso can accompany you hiking, camping, or on road trips – provided you always have a supply of espresso grounds and hot water available.